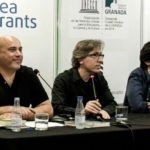 First season of Literary Conversations from Granada UNESCO City of Literature Programme. 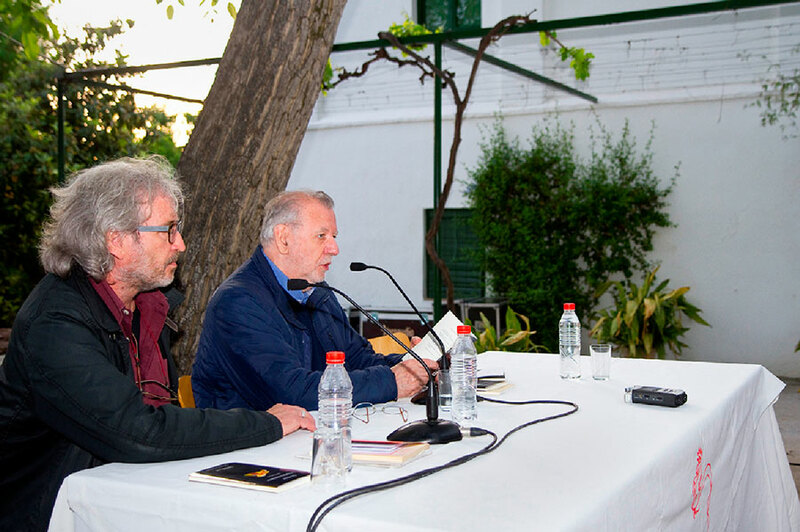 Óscar Hahn introduced by Miguel Ángel Arcas, Huerta de San Vicente, Federico García Lorca’s Museum House, April 21, 2015. At Granada Book Fair. Óscar Hahn (b. Iquique, Chile, 1938), a poet, essayist and literary critic, studied education at the University of Chile at Arica (now University of Tarapacá), where he became a lecturer in the Spanish department. In 1971 he went to Iowa for the International Writers Programme, where he obtained a master’s degree in literature. He returned to Chile two years later and taught for a short period, but after the 1973 coup d’état he was arrested and held in Arica prison. After his release, he obtained a PhD from the University of Maryland, where he studied until 1977, when he joined the Spanish-literature faculty at the University of Iowa, living there until 2008. He is the US correspondent of the Academia Chilena de la Lengua (since 2011) and a member of the council of the Vicente Huidobro Foundation. His works have been translated into several languages, especially English and German. Hahn won the Casa de América Poetry of the Americas Prize in 2006, the José Lezama Lima Poetry Prize in 2008, the Pablo Neruda Ibero-American Poetry Prize in 2011 and was awarded the Chilean National Literature Prize in 2012. His many works include Tratado de sortilegios (Hiperión, 1992), Versos robados (Visor, 1995), Antología virtual (Fondo de Cultura Económica, 1996), Apariciones profanas (Hiperión, 2002), En un abrir y cerrar de ojos (Visor, 2006), Poemas de la era nuclear (Bartleby Editores, 2008) and Archivo expiatorio: Poesías completas 1961–2009 (Visor, 2009). In 2014 he won the Loewe Poetry Prize (Spain) for Los espejos comunicantes. Miguel Ángel Arcas (b. Granada, 1956) holds a Spanish degree from the University of Granada. His first poetry collection, Los sueños del realista (Fundación Miguel Hernández, 2000), won the Miguel Hernández National Poetry Prize in 1998. His second collection was El baile (Cuadernos del Vigía, 2002). Llueve horizontal (Hiperión, 2015) won the City of Córdoba Ricardo Molina Poetry Prize. He also published two books of aphorisms, Aforemas (José Manuel Lara Foundation, 2004) and Más realidad (Pre-textos, 2012). He is the publisher of the imprint Cuadernos del Vigía.